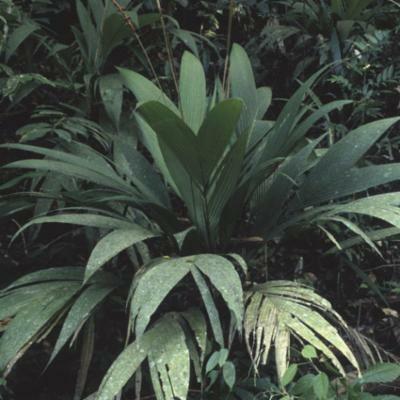 This genus is accepted, and its native range is SE. Mexico to Central America. Leaf (Tomlinson 1961, Wessels Boer 1968), root (Seubert 1998a, 1998b), and flower (Stauffer and Endress 2003). Understory palms of tropical rain forests. Abundant in swamps and along stream margins, some species at elevations below 700 m only, other species from 700–2200 m. Bats have been observed pollinating the flowers in Costa Rica (Beach 1986). 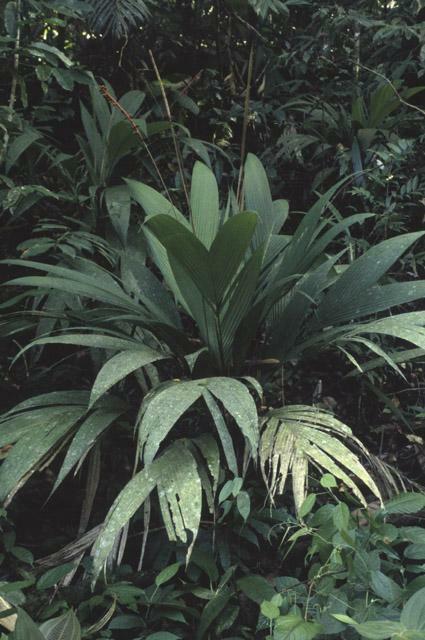 Nine species from Mexico and Guatemala to Colombia. Small, solitary, unarmed, pleonanthic, monoecious palms. Stem often subterranean or short and erect, leaf scars indistinct or clearly defined, internodes sometimes rusty-brown tomentose. 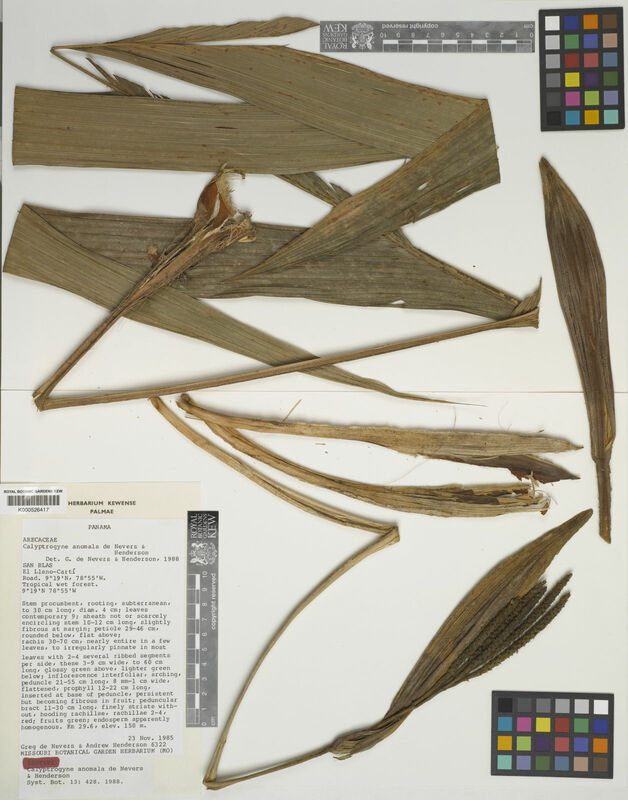 Leaves few, about 10, pinnate, usually irregular, or bifid and pinnately veined, marcescent; sheath splitting opposite the petiole, densely covered in dark caducous tomentum, margins with large fibres; petiole slender, rather short, evenly concave adaxially, angled abaxially, sparsely tomentose; leaflets irregular in width, distant, 1–several fold, tapering to pointed tips, lightly waxy-tomentose and with small scales on both surfaces, larger scales abaxially along midrib, midrib and 1–2 pairs of veins prominent abaxially, transverse veinlets usually not evident. Inflorescence interfoliar, slender, spicate, rarely branched to 1 order, erect peduncle very long, slender; prophyll tubular, rather thin, pointed, with two flat, narrow lateral keels, papery to coriaceous, striate, lightly scaly, splitting distally, inserted near the base of the peduncle; peduncular bract terete, pointed, striate, lightly scaly, membranous, splitting distally, inserted near or a short distance below the floral pits, often caducous leaving a ruffled scar; rachis very short, bearing 1–2 small empty bracts, short or long, often much larger in diameter than the peduncle, glabrous or densely brown tomentose; rachillae bearing alternate rows (7–11) of closely appressed, marginally thin, glabrous or tomentose, ovate bracts, each subtending a triad of flowers borne in a pit, floral bracteoles unequal, somewhat keeled, thin, membranous, tips pointed. 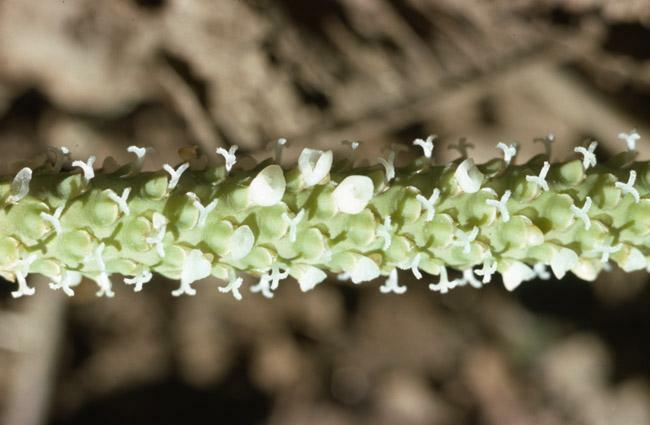 Staminate flower slightly asymmetrical; sepals 3, free, elongate, unequal, imbricate at base or throughout in bud, narrow, tips irregular, somewhat truncate, sometimes tomentose; petals 3, asymmetrical, united in a soft tube for ca. l/2 their length, free lobes unequal, valvate, chaffy; stamens 6, filaments fleshy, united and adnate to the receptacle forming a solid stalk, free lobes thick, awl-shaped, recurved at anthesis, anthers sagittate, dorsifixed near the base, decurved with bases uppermost at anthesis, introrse; pistillode minute, deltoid. 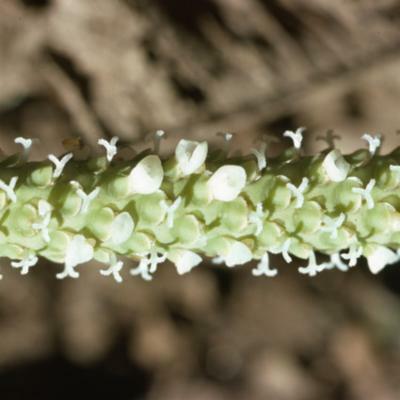 Pollen ellipsoidal, usually with either slight or obvious asymmetry, occasionally oblate-triangular; aperture a distal sulcus, or trichotomosulcus; ectexine tectate, coarsely perforate, finely rugulate or, coarsely perforate-rugulate, aperture margin finer; infratectum columellate; longest axis 47–66 µm [6/9]. Pistillate flower asymmetrical, adaxial side curved to conform to the pit wall; sepals 3, free, unequal, imbricate, two lateral ones keeled, abaxial one smaller, flattened; petals united in a tube, very briefly free and valvate distally, tube striate, distal 1/3 shed as a cap, lower part of tube remaining in the pit; staminodes united in a tube, constricted near the middle, very briefly 6-lobed distally, upper part shed to reveal the stigmas; gynoecium trilocular, triovulate, asymmetrically 3-lobed, style triangular in cross-section, elongate, ending in 3 linear stigmas, reflexed at anthesis, ovule anatropous, basally attached. Fruit obovoid, 1-seeded, purple or black when ripe, stigmatic residue and abortive carpels basal; epicarp smooth, mesocarp fleshy with inner layer of large anastomosing fibres, the largest median and completely encircling, endocarp ± transparent, tough. Seed ellipsoidal, basally attached, hilum short, raphe encircling, unbranched, endosperm homogeneous; embryo eccentrically basal. Germination adjacent ligular; eophyll bifid. Cytology: 2n = 28. 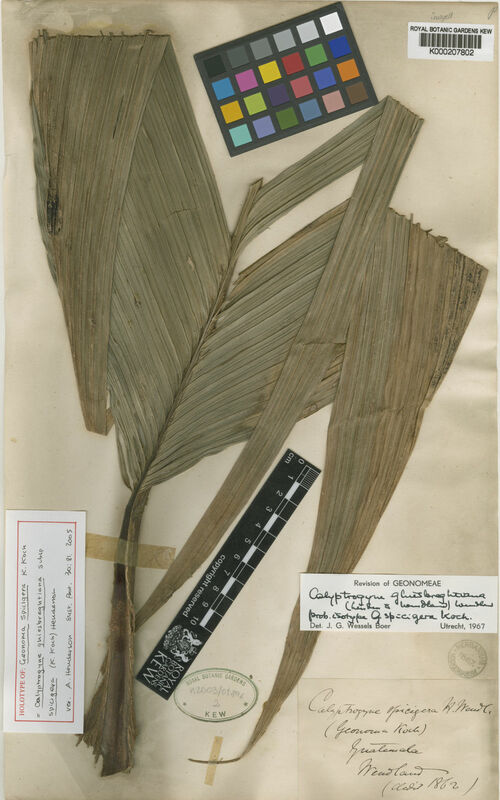 Small acaulescent or short-stemmed pinnate-leaved palms of rain forest in Central and northern South America, distinctive in the inflated staminodal tube in the pistillate flower. Calyptrogyne anomala de Nevers & A.J.Hend. Calyptrogyne ghiesbreghtiana (Linden & H.Wendl.) H.Wendl.